Were you naughty? or nice? Toy review. It is always fascinating to me which gifts end up being the kid’s favourites. To review.. here is what my four year old received this year. – The $1 star-shaped pop-up hairbrush, from Michaels (the craft store). This was one of the biggest hits for her. It even has a mirror on the inside. – Disney Princess Colouring Thingy. Again, $1 at Michaels. Loved. Coloured. Done. – Some mini chocolate eggs. Hoarded in her drawer. – A ‘growing hair’ (kind of like a chia pet) thingy. She did not really care for this and almost gave it to her sister. 1. 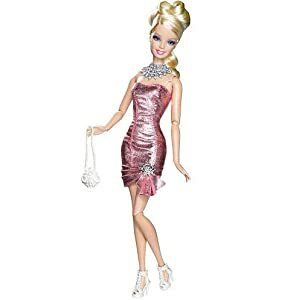 From Santa .. this Barbie swapping heads fashionista doll. 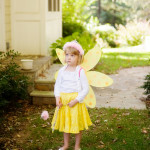 She was immediately stripped of her clothes and made to wear some other dress… and in the process the necklace was lost and there was a HUGE meltdown. Barbie.. how i hate you! And apparently her head does come off and can be swapped with other fashionista barbies. 2. Also from Santa, this mirror thingy. She has had her eye on one for the past year and in her words “That is the exact thing I wanted for SO LONG! How did Santa KNOW?“. 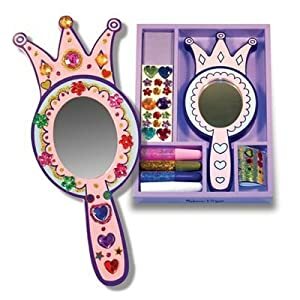 Well kid, Santa didn’t but Mom heard you, each and every time you told her how much you wanted the mirror. And that was about three thousand times too many. The kid decorated the mirror before lunch today and was happy as a lark. Warning : Glitter is involved. If you are like me and, as my kids often repeat “Glitter stays in the Garage“, then be worried. Very worried. 3. From me, this 100 piece puzzle. Which she took out and promptly put back.. declaring it was ‘too hard‘. We will work on that tomorrow. Puzzles buy lots of quiet time. 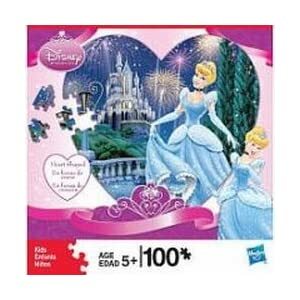 We love puzzles. 4. From her dad, this Ballet Activity Book. 5. From her cousins, Princess Chutes and Ladders. We played. And she cried every time her princess went down a chute. We will play some more tomorrow. The crying will stop eventually. Right? Right? She also got some lovely pajamas from her glamourous aunt. Pink, of course! And a princess pop-up playtent and make up from my lovely neighbour. Clearly, this ‘low-key’ Christmas thing didn’t work out quite as we planned… it is impossible to get just one or two gifts.. so I have given up on feeling guilty about it. Now, onto the 7 year old. She actually specifically requested for a new camera from Santa. 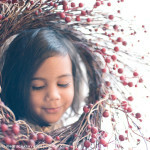 And as a photographer and her mom, how on earth would I let Santa give her something that takes bas photographs? No. No. She did not get an SLR people.. calm down. 1. So she got this camera.. i think it is a 2007 model. There was no way I was getting her a kid camera. The Fisher Price ‘Kid Tough’ one was more expensive than this one. And I think a 7 year old is capable of taking care of her things. Hopefully. 2. Also from Santa (who sometimes shops at Costco), the Kaya American Girl book-set with the mini doll. My 7 year old must be the only freak who prefers the mini-dolls to the real size AG dolls (which I know are a total rip off but I repeat to myself : ‘the stories are educational. the stories are well written’ and let go of the guilt. The stories truly are educational and well written. Truly. 3. From me : The first Nancy Drew book. Oh how I loved Nancy Drews when I was little. And I love that she loves them now too. And probably the biggest hit.. the 20 Mini Mysteries from American Girl. I swear my kid would be the best detective ever. She loves mysteries. Just today she was solving the Mystery Of The Missing Barbie Necklace. She took photographs, made copious notes (where was it last seen, who saw it last, description etc). 4. From her dad: She loves this book and has already lectured me about blue whales and how there are only 6000 left in the world. She too got some pajamas from her glam-aunt, a huge book full of classic christmas stories from her cousins and a butterfly catching thingy from our lovely neighbours. I think her favourite things (so far) are the camera and the Mysteries book. She also played for a couple of hours with all her AG mini dolls… introducing Kaya to the rest of the crew. I got two most excellent gifts…. the first, from my sister and brother-in-law, this wonderful cookbook. I have already marked several recipes that I must try. Get it. It’s like a bible of the best of the best NY Times recipes. And from my husband, a gift certificate to Circe, which I will be using as soon as the kids are back in school. Yay me! So all in all, it was a most excellent Christmas. The husband made some delicious braised short ribs. They are to die for! And some mashed potatoes (of course!) and broccoli and bread to soak up all the yumminess. We are so blessed. And the best gifts really weren’t found under the tree or in a stocking. The best gifts are our healthy and happy (for the most part) children, our marriage, our parents, our family and our friends. But since none of that could be wrapped up with pretty paper and a bow, we got everyone stuff instead. Lana - Wonderful gifts! I’m intrigued by the Barbie swapping heads doll. Are you going to find her headless most of the time?